How would you depict "unity" or a sense of "one accord" if you were writing a hymn? How would you create a sense of "oneness" in the melody? How would you use the harmony to color the emotions of "unity?" Joseph J. Daynes, the composer of Hymn #25, make some obvious choices, and some radical choices in his quest for congregational unity. I find both very effective/affective. Is there a hymn that reminds you more of the old missionary First Discussion? I know those missionary "discussions" are a thing of the past, but reading this text brought back a lot of memories of 1st 'Charlas', as we called them in Chile. We taught hundreds of 1st 'Charlas' a month. This hymn text sums ups the beginnings of the Restoration by discussing the prophet Joseph, the Book of Mormon, the spreading of the gospel, and looking forward to the gathering and the Millenium. But what's fascinating to me about the text is that when this hymn was first published, these events had only just occurred. It was published in 1835, 15 years after the First Vision, 6 years after the publication of the Book of Mormon, and only 5 years after the establishment of The Church of Jesus Christ of Latter-day Saints. The idea that the Restoration was happening right before their eyes is an exciting one. The truth is, it's still happening. Look at President Nelson. The heavens are still open, the Prophet receives revelation and directs the global church on a daily basis. There is a bit of an oddity with the meter of the text. Do you notice how the rhyme is missing? Take a look at the last line of the hymn, "Go and prune my vineyard, son!" What does "son" rhyme with? Nothing. What's happening is, the original text was written in 4 short stanzas and there were 8 stanzas. The composer decided to make the hymn tune twice as long as the text, so he combined stanzas into a single verse. The structure of the original 4-line stanzas was to have 3 short rhyming lines followed by an ending line that summed up the statement but did not rhyme with the previous 3 lines. Not that uncommon. But it standouts a bit when 2 stanzas are smooshed together. Our hymn singing ear expects the end of line 4 to rhyme with the end of line 8. But that doesn't happen here. Oh well, no biggie. Let's skip over to the music because there are some really interesting things going on in this hymn, especially with the harmony. The melody begins with a big burst of energy. The leaping down followed by the rhythmically fueled ascent up tot he high D is a bold way to begin a hymn. And since it's a bold subject being discussed, this seems very appropriate. After the rise to the high D, we stay up in the high register and cadence, or pause, on the high B-flat, Do. Line 2 begins the same way and is rounded off with a half cadence, or a pause on the 5 chord with some different melody notes at the end leading towards Sol but keeping the same rhythms. After this pause in the middle register on Sol, the F, we spend the next 2 lines making our way back up to the final high Do at the end of the piece. But the composer, instead of following his M.O. in lines 1 and 2, that of a 4-bar melody, breaks up lines 3 and 4 into 4, 2-bar melodic cells. These cells become much more interesting when we look at the harmony. More on that in a minute. Cell 1 (first 2 bars of line 3) retain the same basic rhythm as before but ends by rising from Sol right back up to D and pausing on a 1 chord. Cell 2 (bars 11-12) is almost an exact repeat of Cell 1, but it's raised by one step, starting on G and rising up to high C. We have a sequence! Will he keep it going in Cell 3? Cell 3 (bars 13-14) stays on the high C and works it's way down. So, no, it's not a continuation of the sequence, but the same rhythm is used except for the moving quarter notes at the end of bar 14. These downward quarters lead us to Cell 4. Cell 4 (last 2 bars) keep the steady quarter notes going all the way to the end. First, there's a little barbershop half-step downward motion, G-Gflat-F, then a leap up and a return home, Bflat-Bflat-A-Bflat. What makes this hymn so interesting to me is the harmony. But the question for me when it comes to clever harmony, especially when there are lots of accidentals present, is, "does the harmony support the tune and message, or does it distract us and go a little too over the top?" Line 1 begins with an obvious unionizer, the opening tune with everyone singing the tune. Great! And right away, upon reaching the high D in the melody, we get some chromatic harmony. Instead of landing on a big B-flat chord, which is was most would do, the composer jumps to a major 3 chord. The 3 chord is usually minor. 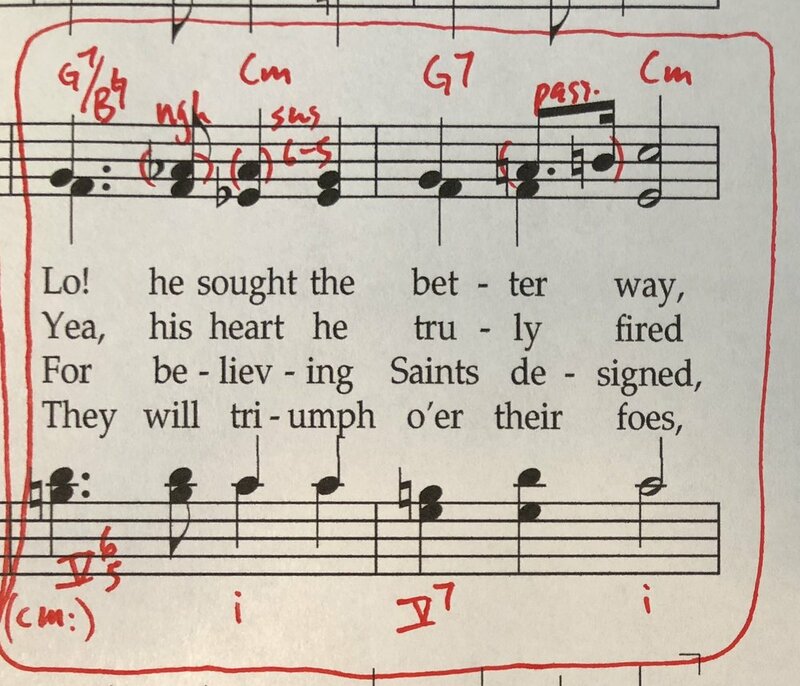 This gives the opening passage an extra measure of boldness, but it's not so far fetched as to seem out of place because of the common D that the B-flat chord and the D chord share. Then, we get another interesting chord right afterwards, a G major chord with a 7th on it. The g chord in this key is supposed to be minor. Again, he uses the change of minor chords to major chords as a harmonic power play. "Look out world, we have something to say!" Line 2 begins as line 1 did, but this time gives us the B-flat chord on the high D that we expected in line 1. In a similar fashion, we get a few colorful chords at the end of the line. First comes the C major chord on "Cheers." The c chord is supposed to be minor in this key. It sounds like he's using this chord to land on a paused 5 chord, which if you look ahead, he does. That E-natural is leading us to a cadence on the F chord. But before we arrive, we make a little pit stop on a diminished chord that doesn't belong to the key. On the word "as" we get a B-natural-D-F-A chord. That's the 7 diminished chord in the key of C. So he uses that chord to resolve to another C major chord on the "an-" on "anciently." This leads us with unmistakable gravity to the pause on the 5 chord. Very nice. Now for the really fun part, the 4, 2-bar cells that we looked at before. What really makes these guys interesting is the harmony. Let's take them one at a time. Cell 1. The composer decides to extend the 5 chord he paused on at the end of line 2. This 5 chord resolves as it should to the 1 chord. Very basic. Notice the 2 non-chord-tones in the melody. There's a bit of a neighbor-tone followed by a suspension. This gives the melody a little extra character. Cell 2. When we looked at the melody, we noticed that Cell 2 is the same as Cell 1, but up a step. In fact, it's not just the melody that does this, the harmony follows along. It's as if we've suddenly shifted up into the key of C minor. If you try to analyze it in B-flat, you get all kinds of secondary chords. It makes more sense in C minor. And now compare the chords of Cell 2 to Cell 1. They are the same. Just in a new key, up a step. Even the non-chord-tones are the same. Cell 3. We expect something similar with the sequence created in Cells 1 and 2. We don't quite get the same tune, it goes its own way. But we do get nearly the same harmony. However, again, it's in a new key. It's as if we've now slipped into G minor. and when you compare the chord of Cell 3 to Cells 1 and 2, they are almost exactly the same. It's a little different at first, and there are a few extra non-chord-tones that I've bracketed. So, to this point, we've spent time in 3 different keys within 6 bars of music. Pretty cool. Cell 4. Now, we absolutely MUST find our way back home to B-flat. But how? We've gone all over through these different keys. Well, the first chord of Cell 4 actually belongs in all of these keys. In B-flat it's the 2 chord. In C minor, it's the 1 chord. In G minor, it's the 4 chord. And now that we're back in B-flat major, why not start off this final phrase with a chord that is common to all of the keys as a pivot back to the correct key, the key they hymn started in. But look at all that chromatic motion. He clearly doesn't want to make the return home too easy. But really, it's only 1 wacky chord being used that makes this harmony look so complicated. He's using what we call a German Augmented 6th chord. It's sort of a "wedge" chord that can fit right before a dominant chord adding some color to the resolution to the 5 chord before it finally returns to the 1 chord. German +6 chords usually only happen in minor. Some people give this a different name, like the "Swiss" +6. I like to call it the "Polish" +6 chord because it seems like something Chopin would do. He uses this kind of wedge-like harmony all the time. And I'm partial to Poland and Chopin because I lived there for 9 months and got a post-doc at the Chopin University of Music. So, I'll call it a "Polish Augmented Sixth Chord." Basically, this is a dominant 7th chord, but in the wrong key. And see how it has a B-flat in it? That's a common tone with the key we're in. So, the B-flat, Do, is the rope that ties this wacky chord to the key we're in. The composer takes Do and makes it the 3rd of a Dominant 7th Chord. In this case, the chord is a G-flat dominant 7th chord. G-flat, B-flat, D-flat, F-flat. But, because it's in the wrong key, and because some of these notes need to resolve a different way than usual, we re-spell the D-flat as a C-sharp and the F-flat as an E-natural. The E-natural resolves up to the F and the C-sharp resolves up to the D.
And he uses it more than once. We get it on the word "and" as well as on the word "my" and in a different inversion. The 2nd time the editors of the hymnal changed the spelling of the C-sharp to a D-flat. This is wise because it helps the tenors find their note. It's much easier to leap from a B-flat up to a D-flat than it is to leap to a C-sharp. It just plays tricks on the mind. Anyway, I think all this harmony is fabulous. And to my ears, it doesn't get in the way at all. There's enough conventional harmony and connecting tissue between convention and experimentation that it holds together really well. Stay tuned tomorrow for some real First Vision action. See you soon! P.S. Don't forget to subscribe below. Just hit the button. P.P.S. Need some help with your hymn? Apply for a critique below and I'll give your piece the TLC it needs. I am not a Honda owner, but still love this hymn! I think the vast harmonic interest really adds to this hymn. Again I must say that these hymns by organists just seem to have a little bit extra that makes them so interesting and memorable. I also think that the Richard Elliott arrangement of this hymn for choir is quite lovely and worth a listen. This is another hymn that although is specified in four, really wants to feel in two. It seems that a tempo of about quarter note equal to 120 is a happy tempo for this tune. The interpretive indication is “boldly,” but I think adding some registrational brightness helps this hymn as well. I would use a principal chorus to mixture, with consideration for adding the high mixture as well, perhaps taking it off for the inner verses and adding it again for the final. Newer PostWhat Is the Highest Form of Hymn Writing?